The HSE now requires that all surgical instrument trays are identified using GS1 Standards to enable stakeholders to track and trace them throughout the supply chain. The ICT system currently being rolled out is designed to create a collaborative, interoperable, and nationwide traceability solution for Central Decontamination Units. Pauline Biggane is project managing the rollout of this system within the HSE and the following is a paper she has written to explain it all. 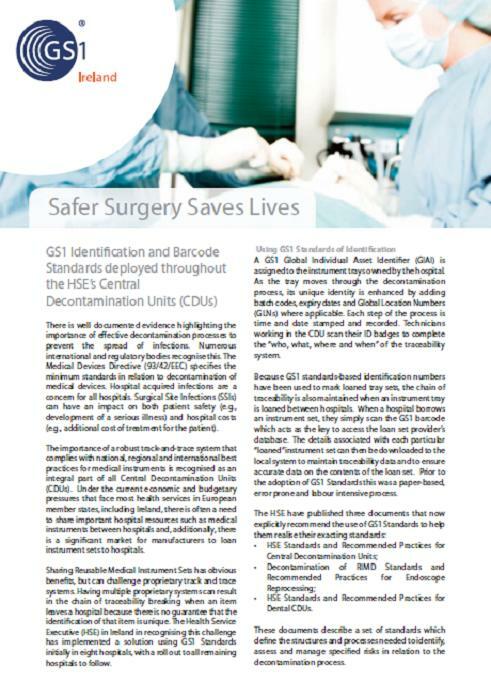 Safer Surgery Saves Lives - GS1 Identification and Barcode Standards deployed throughout the HSE's Central Decontamination Units (CDUs). There is well documented evidence highlighting the importance of effective decontamination processes to prevent the spread of infections. The Medical Devices Directive (93/42/EEC) specifies the minimum standards in relation to decontamination of medical devices. The importance of a robust track-and-trace system that complies with national, regional and international best practices for medical instruments is recognised as an integral part of all Central Decontamination Units (CDUs). Current economic and budgetary pressures mean there is often a need to share important hospital resources such as medical instruments between hospitals and there is also a significant market for manufacturers to loan instrument sets to hospitals. Sharing Reusable Medical Instrument Sets has obvious benefits, but can challenge proprietary track and trace systems. The Health Service Executive (HSE) in Ireland in recognising this challenge has implemented a solution using GS1 Standards (initially in eight hospitals with a roll out to all remaining hospitals to follow). The attached GS1 case study gives a brief overview of the implementation of GS1 Standards within the surgical instrument use-cycle from theatre to decontamination and back again.